Hey bike gurus! I'm a newbie on BF so I hope I posted this thread in the correct location. Dear honorable vintage bicycle mechanics! Looking for expertise on how an original 1987 Schwinn Super Sport BB CABLE GUIDE SHOULD LOOK. I've included a pic of the bike I looked at but turned it down due to the questionable BB issue. Seller was asking $180. Is this a repairable problem? Or, did the bike not have any cable guides originally? It was not uncommon in the 80's and prior for bikes to not have a bottom bracket cable guide other than a groove in the metal of the bottom bracket shell. Should you desire to install a plastic cable guide one can be retro-fitted by using epoxy, double stick foam tape, or you can drill and tap the bottom bracket shell to accept a small screw to hold the plastic guide in place. No pic in your original posting for us to see, but an '87 SS would have had a gray colored plastic guide attached to the outside bottom of the BB with a single short Phillips head screw. I don't have an original one at hand, but do have a couple Shimano replacement ones, you can have one for the cost of postage. rccardr@cox.net if interested. If it's the plastic guide then LBS will have them for a couple of dollars. By 1987 many bikes had gone to under the shell guides. Where the chainstay stop is located tells you in the BB guide is above or below the shell. If below what others have said is the way. 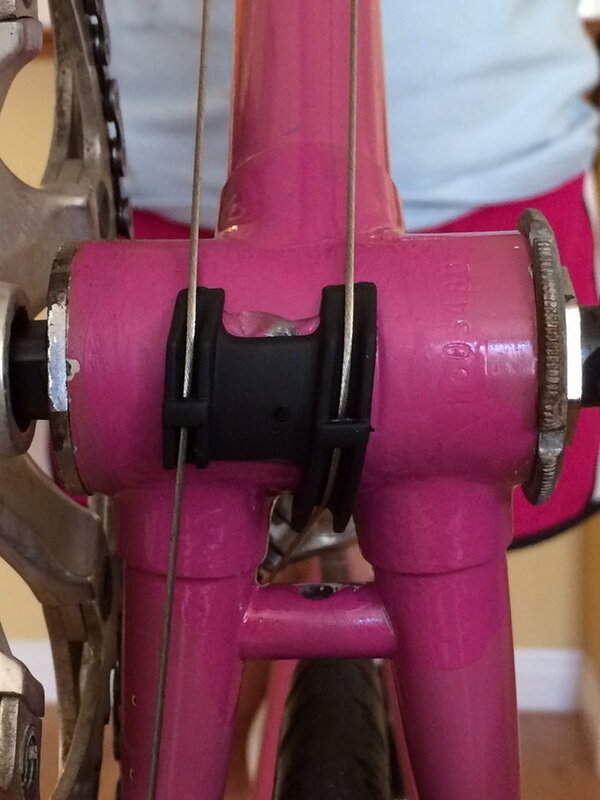 If the chainstay stop is above the stay then the Bb guide(s) need to also be above. Typically a chrome steel clamp around band. These can have a casing stop (or two) or a inner only guide (or two) or one of each, depending on the front der's cable handling. As always the lack of data prevents complete answers, PHOTO. Andy. I'm trying to include a photo of the underside of the BB shell of the Schwinn Super Sport which is still available on CL. Unfortunately, I took a picture with my iphone and sent to my email, then save it to my computer. I can't figure out how to post it on this thread. Basically, the cables just wrap around the BB shell. there should be a plastic cable guide under there but it is missing. There is a small hole in the bottom bracket. It doesn't look like it is threaded. Some of the plastic shell guides have a stud or plug that fits into a smooth hole. Very few production bikes had their cables running on bare shells due to the paint damage. Those that did had some form of cable retention, tunnel or loop to keep the cable running along a set path. Missing any of these suggests that a plastic guide is also missing. But the solution or experiment is pretty low cost. try a plastic guide. Andy. I hope this images copies ok. this photo, if it is there is worth a thousand words. This is my problem that I need to remedy. 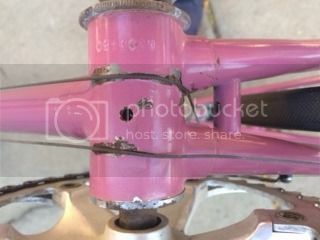 Photo shows the underside of bottom bracket shell where cable guide is missing. PS You gotta love the Miami Vice pink/magenta paint! The 87 Schwinn Super Sport does have the shift cables running under the bb shell, not on top. As already stated in the thread, there are a few ways to install a plastic guide if need be. I think I have a good picture of the issue. 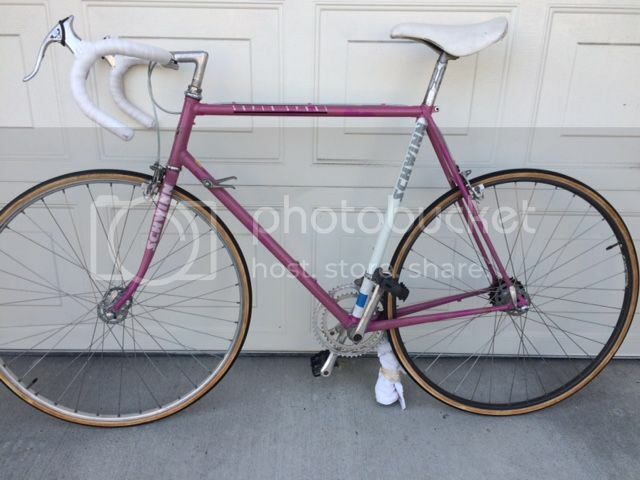 I would like to buy a cable guide for this bike I am planning on purchasing next week. Any advice would be appreciated. From a reliable source I think the cable guide originally was metal with a screw that attaches to the bottom of the BB shell. the plastic one I was given by Doc was too big to fit into the hole. Here is another pic after paint touch up. BB shell cable guide problem solved! tape to attach it to the underside of the BB shell. What BB for my bike?